The plan now is to get some cattle panels and see if we can construct a goat pen that’s easy to take apart and reassemble. If so, we’ll start moving the goats around the land. I’ve got plenty of poison ivy I’d like to see them chew up. I also wouldn’t mind their help with keeping the jungles near the creek at bay. 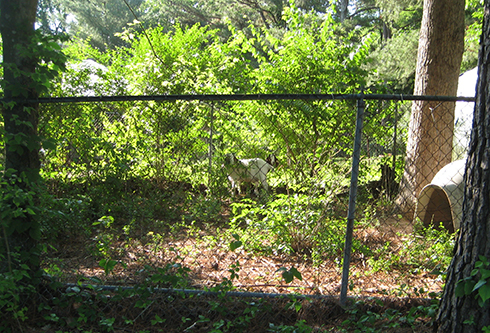 Sara’s not a goat, but she did make a very minor dent in the mint bushes that are threatening to take over near the driveway. When I went outside to play a round of disc golf, she was cutting and twisting some wire into earrings. Then she added mint leaves. 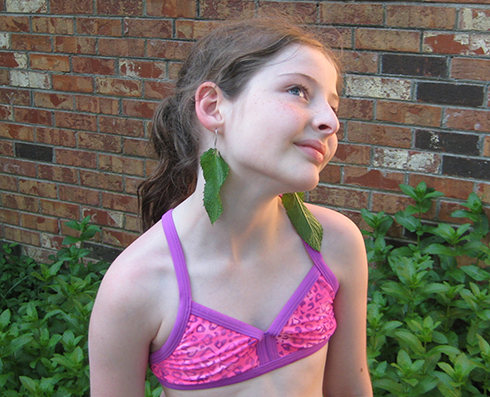 Apparently the theory is that if you wore these earrings to dinner, you could pluck the leaves afterwards and chew on them for breath mints. When she explained this theory to me, I immediately concluded that even though the school year ended less than two weeks ago, she already has too much time on her hands. 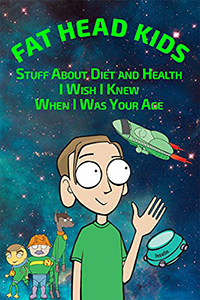 When I explained this conclusion, Sara immediately reminded me that I promised her months ago that when school was out and I was finished with my big software project, I’d help her and Alana produce more episodes of Fat Head Kids’ Club. How can a daughter who takes so much after you be so cute? Don’t stifle her creativity. Love the goats! Naw, no stifling here. I love her imagination. 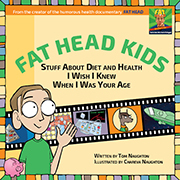 Thanks for making more episodes of the fat head kids club, my kids like to watch the episodes. 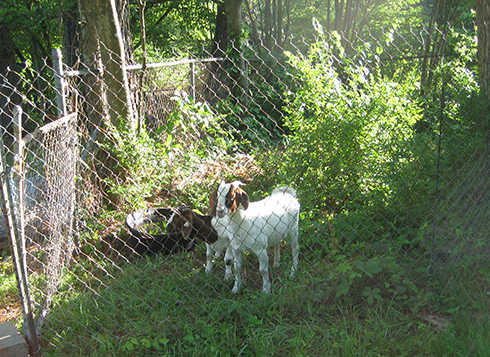 Just make sure the goats don’t lick anyone after chowing down on the poison ivy. I know several people who’ve gotten poison ivy rashes that way. That would make sense. What happens if I lick the goats? Much spitting and gargling of alcohol, I would imagine. And here I thought those goat-licking parties were part of the local charm. 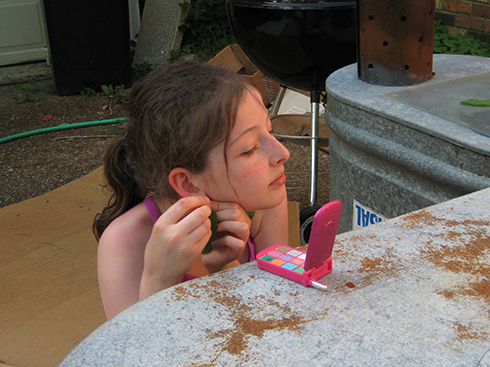 Having observed several nieces while they grew up, I concluded many years go that the young females are even more weird than the older variety. Or maybe I’m just more accustomed to the older ones. I’m surrounded by females, so I’m leaving that one alone. Ever heard the expression “drowning in the deep end of the estrogen pool”? No, but the term fits in my case. All natural, edible jewelry. Much more healthy than candy necklaces. Get the etsy store started! 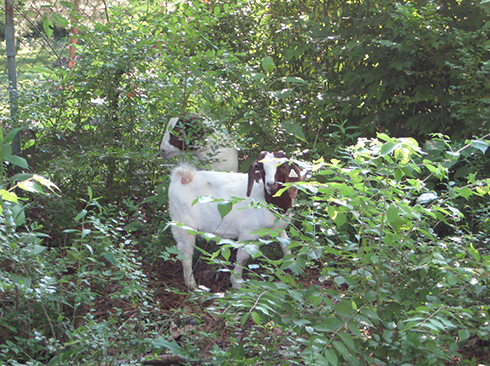 What are you using the goats for, other than weed wacking? Do you milk them? They’re males, so milking them probably wouldn’t work out well. Sara is raising them for a 4-H project. She’ll give them back to 4-H in August, and then we’ll decide if we want our own goats. Try deer fencing. It’s cheap and because it’s made from flexible plastic you can wind it around any random shape you put your posts into. Good luck, I want to get goats too to help tame the overgrown property we bought so I’ll be interested in seeing how it works for you! I’ll have to think about a couple of goats. We bought 1.4 acres, and I’ve got .38 acres that’s full of little trees that’s custom made for a goat or two (I’ve read they like to forage and are not head-down grazers). I’ll be watching to see how you make the movable pen. These are males, so I’m not expecting any milk. If we get more goats after Sara turns these in to 4H, we’d probably opt for a milk-producing female. Been a very long time since I had goat’s milk, but if I remember correctly, it’s really rich – and really good! Almost like drinking cream – or maybe half and half. Yum! My goat knowledge is really hit and miss, but I do know they are excellent climbers. Consider that when you locate the pen. And if you let them at your trees, the trees will all have the same canopy height – excellent little landscapers – but you’re already seeing that, I think. They’re short goats, so I’m cool with the standardized canopy height. If she used doughnuts for breath mints, I wouldn’t be pleased either. Krispy Kreme breath mints. Gag. Yeah, I’m withholding judgment pending further evidence. 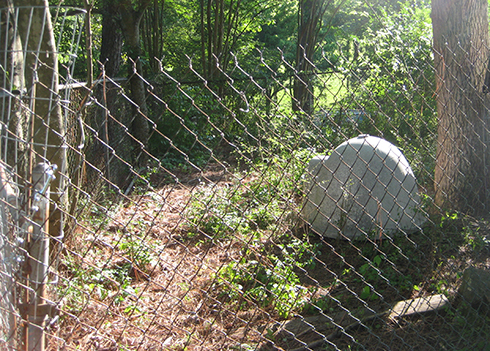 I’d highly, highly recommend portable electric fencing for your goats. We move our animals (30 goats and 3 cows) to new pasture every day and if we had to do it with cattle panels I think we’d shoot ourselves. Plus they’re cheaper than panels, and goats with horns won’t get their heads stuck in them. There are several vendors online who sell them, we like Premier1 for their quality, and make sure you buy a large enough charger. It may seem intimidating and scary for the kids at first, and yes you will get shocked, but everyone will get used to it. Good Luck!